You may have 140 problems, but an out-of-sync Twitter browsing experience isn’t one of them—at least, so long as you’re using the Eddy Award-winning free service Tweet Marker from Riverfold Software. On Monday, Riverfold announced a new, paid upgrade to the service called Tweet Marker Plus. 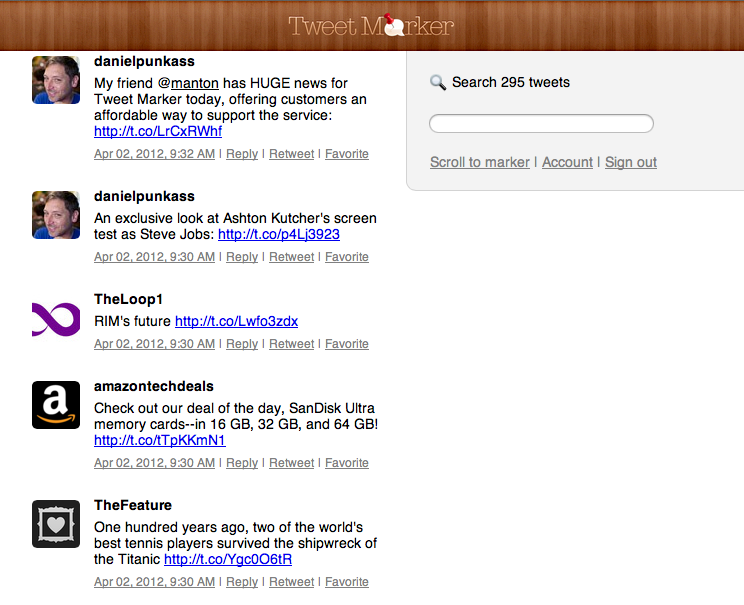 The premium version of Tweet Marker costs $2 per month, and—in addition to several paid-only features—it unsurprisingly includes the core feature of the service’s free incarnation: It makes note of the last tweet you read, so that if you hop between devices (like your Mac and your iPhone) or apps (like Twitterrific and Tweetbot), you needn’t scroll through hundreds of tweets you already saw. Of course, to take full advantage of Tweet Marker’s marquee feature, you’ll need to use any of numerous Twitter clients that integrate with the service; among them are the aforementioned Twitterrific and Tweetbot, Osfoora, and Twittelator Neue. Tweet Marker Plus adds a variety of extra features to this basic offering, most prominently a Web-based Twitter timeline that, of course, syncs with your last reading position as recorded in a Tweet Marker-compatible app. Clicking on a tweet in the Web timeline immediately sets a marker on it (a feature Tweet Marker-compatible clients really ought to add post-haste). Also included in Tweet Marker Plus is a contextual search option, which searches only those tweets from people you follow—in contrasts to Twitter’s own “everyone plus the spam-bots” searching model. Riverfold says that it plans to keep about a month’s worth of your timeline for searching, though that may change depending on the new service’s adoption rates. 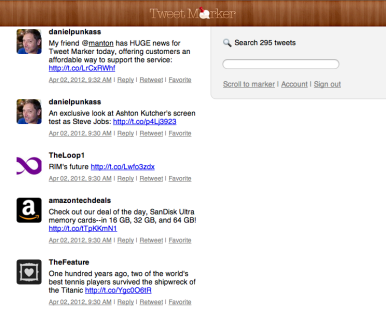 As a Web-based Twitter front-end, Tweet Marker has one major competitor: Twitter.com. Both Web options offer you many of the core Twitter options you’d expect, like quick access to a tweet’s permalink, along with options to reply to a tweet, retweet it, or mark it as a favorite. But each option has significant advantages and disadvantages. Twitter.com, for example, won’t sync with Tweet Marker, so if you switch between it and a Tweet Marker-compatible app, you’ll lose the syncing benefit in both directions. And again, Twitter’s search doesn’t offer Tweet Marker’s option to constrain your searches to just the folks you follow. Tweet Marker Plus, on the other hand, can’t function as a full-fledged Twitter tool the way Twitter.com can: It offers no access to your direct messages, replies, or mentions, and doesn’t include any means to compose a new (non-reply) tweet. In fact, if you click to reply to a tweet, Tweet Marker Plus sends you over to a pre-populated form at Twitter.com to compose your response. Thus, Tweet Marker Plus’s Web offering is probably best thought of as a read-only mode for Twitter, when you have Web access and want to pick up where you left off. Tweet Marker Plus’s nominal $2 monthly fee seems somewhat akin to similarly affordable subscription offerings for premium Web services targeting an especially tech-savvy clientele, like Instapaper subscriptions or TidBits memberships, which combine goals of offering extra niceties while also defraying general ongoing server and maintenance costs. Riverfold prepared this screencast showcasing Tweet Marker Plus’s features.